The GS1-128 formaly known as UCC/EAN-128 is a label format specified by the GS1 (formerly known as Uniform Code Council UCC and EAN) to be used for the purpose of marking shipping containers. The UCC/EAN-128 label is 4 inches wide by 6 inches long and it typically issued in tandem with the Advance Ship Notice which is a widely used EDI document. 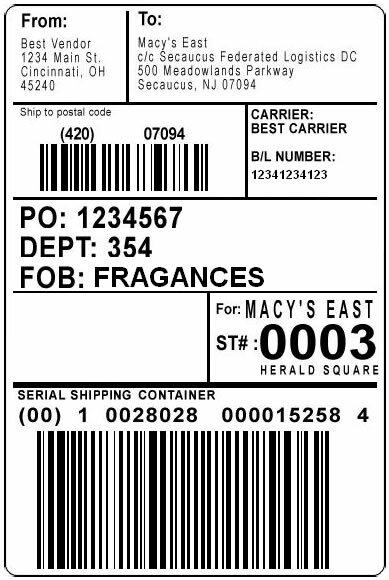 Several details are included on this label but the most essential one is a barcode number, 20 digits in length that identifies the shippers and type of container; more importantly, this number includes a unique serialized number that matches the information transmitted on the Advance Ship Notice. With this coding, recipients can automate the receipt of goods and identify their contents. This 20-digit number is represented on the label with a barcode, using the encoding method code 128. Due to the importance of this label, 123 EDI has included the ability to create and print these labels, which serve as an intrinsic part of a distribution oriented EDI operation and is tightly integrated into our management of Advance Ship Notices. Our solutions are capable of generating all types of different versions of labels, depending upon the specifics of different trading partners. Our labels can also be printed by different types of devices, including laser printers and more robust solutions, such as thermal printers. For purposes of efficiency and reliability, the printing of labels is done directly, using native printer languages so that the generated files are smaller and user-friendly in environments where remote printers are used.